development and activation of the precinct. Ground was broken on the hotel in February 2019, with a sod turning ceremony attended by Member for McPherson, the Hon. Karen Andrews MP, Minster for Tourism Industry Development Kate Jones MP and developer John Robinson. A $50 million Rydges branded hotel with a rooftop bar and viewing deck will be the jewel in the crown of Gold Coast Airport when complete in 2019. 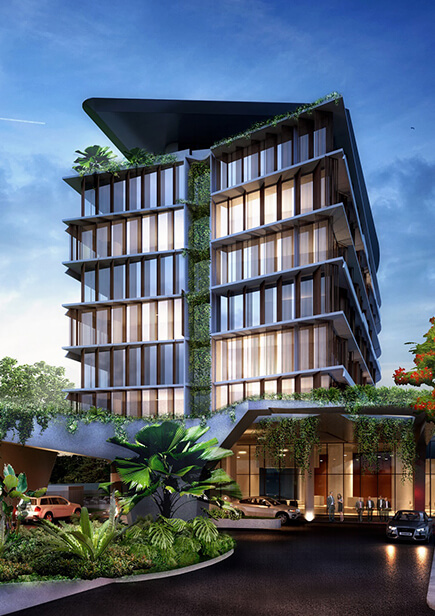 The four star hotel will include 192 rooms and suites over seven storeys with sweeping views over Kirra beach, and across the runway to the hinterland. As well as its rooftop amenity, the hotel will boast a restaurant, resort-style swimming pool, and substantial function, conference and meeting facilities. The Gold Coast Airport Hotel Preliminary Draft Major Development Plan (PDMDP) has been prepared in accordance with the Airports Act 1996 and is subject to approval by the Federal Minister for Infrastructure and Regional Development. The 60 business day public comment period for the PDMDP closed on Friday 4 May 2018. Please note that any submissions received after the closure of the public comment period cannot be taken into consideration. The PDMDP can be downloaded free of charge from this website. For more information, please contact hotelmdp@gcal.com.au.